Educators: Feel free to use/adapt the unit plans and activities on this website. Comments, suggestions, and questions are welcome. With the development of national standards for foreign language education by the American Council on the Teaching of Foreign Languages (ACTFL), the curriculum of foreign language study has been carefully defined to include five categories: communication, cultures, connections, comparisons, and communities. While the first of these five was designated the “heart of second language study,” all were deemed important; in order to honor the various reasons for which students take a foreign language, it was necessary to broaden the definition of “language” study (ACTFL Standards, 1983, p. 2). The national standards have since been influential, helping individual states to define their own criteria. Working with the standards, communication means that students will do more to speak and write the language than complete mechanical drills. Bringing culture, connections, comparisons, and communities into foreign language study allows for authentic learning in which real situations, questions, differences, and similarities are incorporated into the classroom. No longer should foreign language classrooms focus on the rote skills of repetition, conjugation, and memorization. Instead, students will understand a language through the portal of its culture—its practices, products and perspectives. Students will think more broadly, seeing the language as a means of connecting to other disciplines and communities, which can be investigated through materials in the target language. Students will talk about each of these aspects in the target language, communicating about real issues—whether these issues are as universal as the weather or as culturally nuanced as the format of a business letter. In the global society that our students are entering, the ability to analyze a foreign culture, to compare it to their own, and to make culturally sensitive judgments and decisions will be invaluable skills. If one accepts that the standards are a complete set of criteria, the question remains, are they being successfully implemented? As one of the main tools used in most foreign language classrooms, textbooks are one way to gauge educators’ acceptance of the standards. In a literature review, I intend to determine: Do current textbooks help teachers to meet the ACTFL standards? How effective are they in doing so? If textbooks are successful in helping teachers meet the standards, do teachers use the books effectively? Much of the literature on foreign language textbooks encourages the use of communicative tasks that are authentic and contextual, which corresponds well with the ACTFL standards. Lally (1998) points out that context is a crucial part of making language study meaningful. Birckbichler (2001) supports this idea, explaining that language is purposeful as a communicative tool and that as such, the way in which language is taught must go beyond isolated rules and drills. Also in the vein of the ACTFL standards, Birckbichler posits that cultural and interdisciplinary perspectives must be included in language study in order for students to attain a full understanding of the language. However, when current textbooks are examined, sources find that textbooks still have much progress to make. Lally (p. 1998), who completed a study of six foreign language textbooks, asserts that grammar exercises were still characterized by out-of-context drills rather than authentic, conversational models. Of the six textbooks examined, mechanical drills made up 30% of textbook activities (p. 311). Only two of the books integrated writing activities into the chapter; two used them as optional activities, and the remaining two had no full-scale writing exercises (p. 310). Birckbichler (2001) explains that mechanical drills significantly outweighed authentic, communicative ones. She notes that the treatment of culture differed significantly; some texts treated culture as bonuses, relegating cultural details to side notes. Other texts integrated culture fully into the text, building language study around cultural themes. Although she recommends a closer study of interdisciplinary connections in textbooks, she does assert that texts “do not formally explore interdisciplinary connections” currently (p. 297). Thus, while the trend is to encourage communicative, cultural, and interdisciplinary aspects of language study, the reality remains that only some textbooks effectively address them. The presence in textbooks of the remaining two standards, comparisons and communities, are not addressed by the literature. For the latter, there is work on community-based language study, often in the form of service learning or study abroad (Garcia-Alvite, 2005). Perhaps due to the very nature of community-based learning, a textbook is superfluous in this case, where students are involved with the language outside the constraints of an artificial environment or text. Thus, regardless of how well textbooks incorporate activities that promote the study of communication, cultures, comparisons, connections, and communities, the ultimate decision rests with the educator to use or ignore the standards. Birckbichler makes the suggestion that textbooks should remain only one of many tools used by foreign language educators. In order to determine the effectiveness of current textbooks in helping teachers meet the national standards, I chose to evaluate three French textbooks (Bien Dit, Holt, Rinehart, and Winston (2008); Intrigue, Pearson Prentice Hall (2007); Deux Mondes, McGraw-Hill (2005)). I examined two chapters from each text for the number of activities that addressed each standard. In addition, I distinguished between exercises in the main text and exercises found in supplemental areas, such as side notes, end sections, and teacher editions. 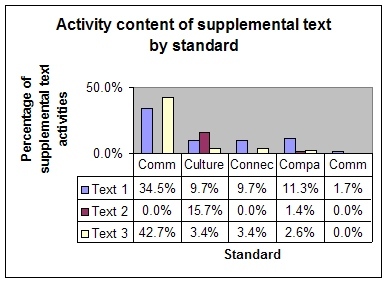 From these data, I determined the percentage of the main text devoted to each standard (see figure 1), the percentage of the supplemental areas devoted to each standard (see figure 2), and the total percentage of each text devoted to each standard (see figure 3). The second text was based around a mystery story, which was woven into each chapter. Grammar, speaking, listening, writing, and reading exercises used the story as context, allowing students to develop skills while also expanding on the plot of the story. Each chapter was organized into an introduction, three “episodes” that developed the story, vocabulary, and grammar, and a conclusion that provided synthesis and review materials. 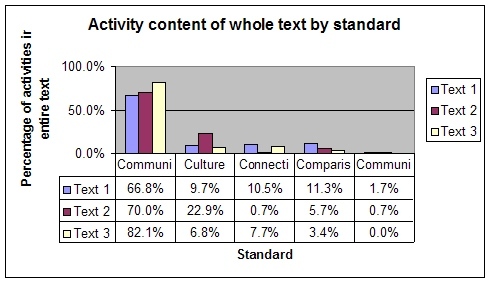 As with the first text, main text activities were primarily communicative, although it differed from the first in that “culture,” “connection,” “comparison,” and “community” standards were also included (to smaller degrees) in the main text. After “communication,” “culture” was the most heavily stressed standard, primarily through supplemental activities. The third text was organized by themes such as family, daily life, and housing. The first half of each chapter focused on communicative exercises, emphasizing new vocabulary and expressions. The second half of the chapter focused on grammatical points, often using communicative exercises as a means of practicing grammar. Of all three texts, the third had the most exercises addressing communicative tasks, followed by connection-making activities. This was the only text in which evidence of the “community” standard was not found. By far, the most prevalent standard included in activities was “communication,” with an average occurrence of 73.0%. As the standards themselves state that communication should be the primary focus of foreign language education, this figure is not surprising. The second most emphasized standard, “culture,” figured in an average of 13.1% of activities. “Connections” appeared in an average of 6.3% of activities, with “comparison” slightly higher at 6.8%. The least amount of weight was placed on “communities,” with only 0.8% of activities devoted to this standard. Compared to the results of previous textbook studies, my results show some progress on the part of textbooks toward the goal of meeting the national standards. Many of the textbooks advertise themselves as taking on a communicative style. Some make correlations with standards for the teacher, marking each activity with the specific standards addressed. In the introductory material to the educator, the standards are often mentioned as a formative part of the text. However, questions are raised when one examines the spread of activities throughout the texts. 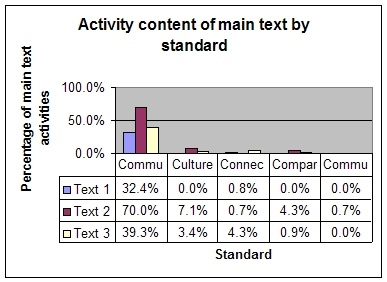 Each text examined clearly emphasized communicative activities, yet the second most stressed standard for each text was different (“comparisons,” “culture,” and “connections”). These differences indicate a variation in thought as to how the remaining four standards (after “communication”) should be emphasized. This does not contradict the purpose of the standards as such, but does have the potential to lead to neglect of other standards than communication due to their relative distance from the central part of the text. To this end, I have created unit plans that work with the ACTFL standards to broaden the scope of language study. Used alongside a textbook or in place of one, such units—when used appropriately by educators—would help fill in gaps that are present in many current textbooks. I have developed thematic units that revolve around authentic texts and materials, concentrating on meeting all five of the ACTFL standards in each unit. Many of the units address topics that are commonly covered by textbooks, such as housing or travel. These may be best used in collaboration with a book, using certain ideas from the unit plan to fill in standards gaps. Other units focus on topics such as Haïti or 19th century France; such topics are not as common in textbooks, yet provide apt entry points for discussion about cultural and interdisciplinary aspects, using authentic texts as a base. Each unit includes a project that brings in the aspect of community; students present findings to audiences outside the class or find ways to apply their learning to a lifelong enjoyment of French language and culture. Birckbichler, Diane W. (2001). Classroom materials for second language proficiency. Theory into practice, 26(4). Retrieved September 24, 2007 from Education Research Complete database. Garcia-Alvite, Dosinda. (2005). Teaching a foreign language in a service learning context. International Journal of Learning, 12(148). Retrieved September 24, 2007 from Education Research Complete database. Lally, Carolyn. (1998). Back to the future: A look at present textbooks and past recommendations. Foreign language annals, 31(3), 307-314.